March | 2011 | Whats4dinner? This is great for when you are scraping the bottom of the barrel. We had half bag of egg noodles, two cans of tuna, frozen peas, mystery cheese powder, fat free cream of mushroom soup, canned mushrooms, Parmesan cheese and crushed wheat roll crumbs. Casserole. I loved it, and DH also had a couple helpings. Most everyone else only had a token bite. But hey, dinner was on the table in 30 minutes. Canned peas would also work, but frozen tastes better. I know I’ve mentioned my love affair with Linguine Pescatore. The tomato sauce, the mussels, the juicy tender scallops…you’ll never believe what I found in the freezer section of my local Aldi. 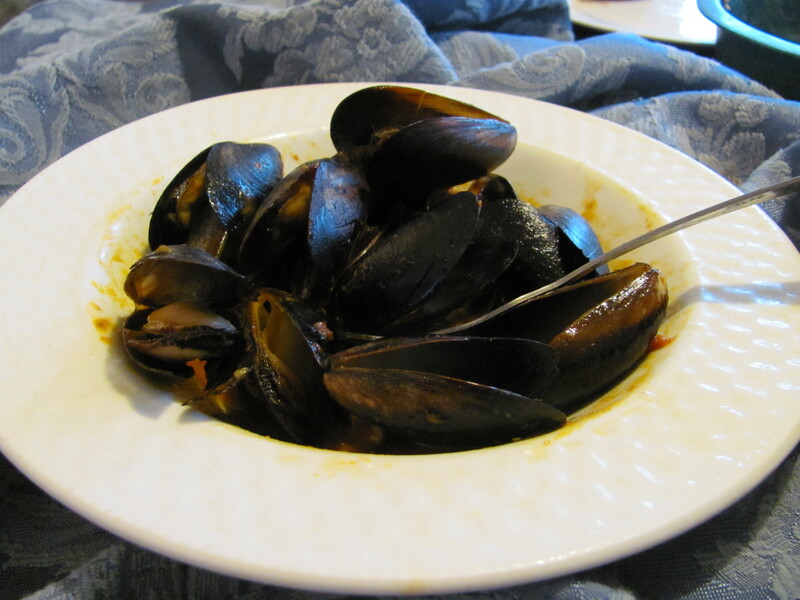 It was their “SeaQueen” brand of seafood, a box of mussels in garlic tomato sauce. It was 3.99. Well, it couldn’t possibly taste as good as Papa Vino’s or Carrabba’s, but hey, for four bucks I sure as heck am going to try it. I would have had to buy the scallops separate, but the mussels are my favorite part anyway. It literally took six minutes to prepare; they popped right open in the hot skillet. Gotta have pasta with my mussels, so I made a package of Ramen, ’cause Farley loves his noodles. I gingerly took my first bite: easily as good as Papa Vino’s! I think Carrabba’s puts some hot chili pepper flakes in theirs, and another herb or two. But for a fraction of the cost of eating out, I am completely happy. Oh, and get this. Only 110 calories in one serving. No way. Only 4 grams of fat, and 11 grams of protein. I am moved to write a poem. I ain’t lyin. This is hard. I just wanted to post this for posterity’s sake. I would like to thank the people in my life who are making this possible: Mute Math, Joe Jackson, Earth Wind & Fire, Nickelback. Thanks for being there for me.